Dilma Rousseff (left image) was elected President in 2010, with a 56-44 per cent majority against the right-wing neoliberal PSDB (Brazilian Social Democratic Party) opposition candidate. She was reelected four years later with a diminished yet convincing majority of 52-48 per cent, or a majority of 3.5 million votes. Dilma’s second victory sparked a heated panic among the neoliberal and U.S.-aligned opposition. The fourth consecutive election of a President affiliated to the centre-left PT (Workers’ Party) was bad news for the opposition, because it suggested that PT founder Luís Inácio (Lula) da Silva could return in 2018. Lula had been President between 2003 and 2010, and when he left office his approval ratings hit 90 per cent, making him the most popular leader in Brazil’s history. This likely sequence suggested that the opposition could be out of federal office for a generation. The opposition immediately rejected the outcome of the vote. No credible complaints could be made, but no matter; it was resolved that Dilma Rousseff would be overthrown by any means necessary. To understand what happened next, we must return to 2011. 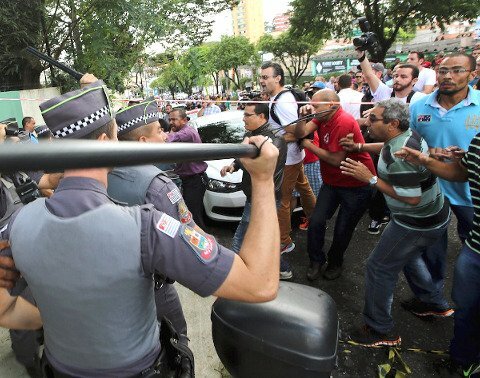 Supporters of Lula confront police officers in front his apartment in Sao Bernardo do Campo, March 2016. Dilma inherited from Lula a booming economy. Alongside China and other middle-income countries, Brazil bounced back vigorously after the global crisis. GDP expanded by 7.5 per cent in 2010, the fastest rate in decades, and Lula’s hybrid neoliberal-neodevelopmental economic policies seemed to have hit the perfect balance: sufficiently orthodox to enjoy the confidence of large sections of the internal bourgeoisie, and heterodox enough to deliver the greatest redistribution of income and privilege in Brazil’s recorded history, thereby securing the support of the formal and informal working class. For example, the minimum wage rose by 70 per cent and 21 million (mostly low-paid) jobs were created in the 2000s. Social provision increased significantly, including the world-famous Bolsa Família conditional cash transfer programme, and the government supported a dramatic expansion of higher education, including quotas for blacks and state school pupils. For the first time, the poor could access education as well as income and bank loans. They proceeded to study, earn and borrow, and to occupy spaces previously monopolized by the upper middle class: airports, shopping malls, banks, private health facilities and roads, that were clogged up by cheap cars purchased in 72 easy payments. The government coalition enjoyed a comfortable majority in a highly fragmented Congress, and Lula’s legendary political skills managed to keep most of the political elite on side. Then everything started to go wrong. Dilma Rousseff was chosen by Lula as his successor. She was a steady pair of hands and a competent manager and enforcer. She was also the most left-wing President of Brazil since João Goulart, who was overthrown by a military coup in 1964. However, she had no political track record and, it would later become evident, lacked essential qualities for the job. Once elected, Dilma shifted economic policies further away from neoliberalism. The government intervened in several sectors seeking to promote investment and output, and put intense pressure on the financial system to reduce interest rates, which lowered credit costs and the government’s debt service, releasing funds for consumption and investment. A virtuous circle of growth and distribution seemed possible. Unfortunately, the government miscalculated the lasting impact of the global crisis. The U.S. and European economies stagnated, China’s growth faltered, and the so-called commodity supercycle vanished. Brazil’s current account was ruined. Even worse, the U.S., UK, Japan and the Eurozone introduced quantitative easing policies that led to massive capital outflows toward the middle income countries. Brazil faced a tsunami of foreign exchange, that overvalued the currency and bred deindustrialization. Economic growth rates fell precipitously. The government doubled its interventionist bets through public investment, subsidised loans and tax rebates, which ravaged the public accounts. Their frantic and seemingly random interventionism scared away the internal bourgeoisie: the local magnates were content to run government through the Workers’ Party, but would not be managed by a former political prisoner who overtly despised them. And she despised not only the capitalists: the President had little inclination to speak to social movements, left organizations, lobbies, allied parties, elected politicians, or her own ministers. The economy stalled and Dilma’s political alliances shrank, in a fast-moving dance of destruction. The neoliberal opposition scented blood. For years, the opposition to the PT had been rudderless. The PSDB had nothing appealing to offer while, as is traditional in Brazil, most mainstream parties were gangs of bandits extorting the government for selfish gain. The situation was so desperate that the mainstream media overtly (!) took the mantle of opposition, and started driving the anti-PT agenda, literally instructing the politicians on what to do next. In the meantime, the radical left remained small and relatively powerless. It was despised by the hegemonic ambitions of the PT. The confluence of dissatisfactions became an irresistible force in 2013. The mainstream media is rabidly neoliberal and utterly ruthless: as the equivalent would be if Fox News and its clones dominated the entire U.S. media, including all TV chains and the main newspapers. The upper middle class was their obliging target, as they had economic, social and political reasons to be unhappy. Upper middle class jobs were declining, with 4.3 million posts paying between 5 and 10 minimum wages vanishing in the 2000s. In the meantime, the bourgeoisie was doing well, and the poor advanced fast: even domestic servants got labour rights. The upper middle class felt both squeezed and excluded from their privileged spaces, as was explained above. It was also dislocated from the state. Since Lula’s election, the state bureaucracy had been populated by thousands of cadres appointed by the PT and the left, to the detriment of ‘better educated’, whiter and, presumably, more deserving upper middle class competitors. Mass demonstrations erupted for the first time in June 2013, triggered by left-wing opposition against a bus fare increase in São Paulo. Those demonstrations were fanned by the media and captured by the upper middle-class and the right, and they shook the government – but, clearly, not enough to motivate them to save themselves. The demonstrations returned two years later. And then in 2016. Now, reader, follow this. After the decimation of the state apparatus by the pre-Lula neoliberal administrations, the PT sought to rebuild selected areas of the bureaucracy. Among them, for reasons that Lula may soon have plenty of time to review, the Federal Police and the Federal Prosecution Office (FPO). In addition, for overtly ‘democratic’ reasons, but more likely related to corporatism and capacity to make media-friendly noise, the Federal Police and the FPO were granted inordinate autonomy; the former through mismanagement, while the latter has become the fourth power in the Republic, separately – and checking – the Executive, the Legislature and the Judiciary. The abundance of qualified jobseekers led to the colonization of these well-paying jobs by upper middle class cadres. They were now in a Constitutionally secure position, and could chew up the hand that that fed them, while loudly demanding, through the media, additional resources to maul the rest of the PT’s body. For years the PT had thrived in opposition as the only honest political party in Brazil. This strategy worked, but it contained a lethal contradiction: in order to win expensive elections, manage the Executive and build a workable majority in Congress, the PT would have to get its hands dirty. There is no other way to ‘do’ politics in Brazilian democracy. We only need one more element, and our mixture will be ready to combust. Petrobras is Brazil’s largest corporation and one of the world’s largest oil companies. The firm has considerable technical and economic capacity, and it was responsible for the discovery, in 2006, of gigantic ‘pre-salt’ deep sea oilfields hundreds of miles from the Brazilian coast. Dilma Rousseff, as Lula’s Minister of Mines and Energy, was responsible for imposing exploration contracts in these areas including large privileges for Petrobras. This legislation was vigorously opposed by PSDB, the media, the oil majors and the U.S. government. In 2014, Sergio Moro, a previously unknown judge in Curitiba, a Southern state capital, started investigating a currency dealer suspected of tax evasion. This case eventually spiralled into a deathly threat against Dilma Rousseff’s government. Judge Moro is good-looking, well-educated, white and well paid. He is also very close to the PSDB. His Lavajato (Carwash) operation unveiled an extraordinary tale of large-scale bribery, plunder of public assets and funding for all major political parties, centred on the relationship between Petrobras and some of its main suppliers – precisely the stalwarts of the PT in the oil, shipbuilding and construction industries. It was the perfect combination, at the right time. Judge Moro’s cause was picked up by the media, and he obligingly steered it to inflict maximum damage to the PT, while shielding the other parties. Politicians connected to the PT and some of Brazil’s wealthiest businessmen were jailed summarily, and would remain locked up until they agreed a plea bargain implicating others. A new phase of Lavajato would ensnare them, and so on. The operation is now in its 25th phase; many have already collaborated, and those who refused to do so have received long prison sentences, to coerce them back into line while their appeals are pending. The media turned Judge Moro into a hero; he can do no wrong, and attempts to contest his sprawling powers are met with derision or worse. He is now the most powerful person in the Republic, above Dilma, Lula, the speakers of the Chamber of Deputies and the Senate (both sinking in corruption and other scandals), and the Ministers of the Supreme Court, which have either been silenced or quietly support Moro’s crusade. Petrobras has been paralyzed by the scandal, bringing down the entire oil chain. Private investment has collapsed because of political uncertainty and an investment strike against Dilma’s government. Congress has turned against the government, and the Judiciary is overwhelmingly hostile. After years of sniping, the media has been delighted to see Lula fall under the Lavajato juggernaut, even if the allegations seem stretched: does he actually own a beach-side apartment which his family does not use, is that small farm really his, who paid for the lake and the mobile phone masts nearby, and how about those pedalos? No matter: Moro detained Lula for questioning on 4 March. He was taken to São Paulo airport and would have been flown to Curitiba, but the Judge’s plan was halted by fear of the political fallout. Lula was questioned at the airport, then released. He was livid. In order to shore up her crumbling administration and protect Lula from prosecution, Dilma Rousseff appointed Lula her Chief of Staff (the President’s Chief of Staff has ministerial status and can be prosecuted only by the Supreme Court). The right-wing conspiracy went into overdrive. Moro (illegally) released the (illegal) recording of a conversation between President Dilma and Lula, pertaining to his investiture. Once suitably misinterpreted, their dialogue was presented as ‘proof’ of a conspiracy to protect Lula from Moro’s canine determination to jail him. Large right-wing upper middle class masses poured into the streets, furiously, on 13 March. Five days later, the left responded with large – but not quite as large – demonstrations of its own against the unfolding coup. In the meantime, Lula’s appointment was suspended by a judicial measure, then restored, then suspended again. The case is now in the Supreme Court. At the moment, he is not a Minister, and his head is well-positioned on the block. Moro can arrest him at short notice. Why is this a coup? Because despite aggressive scrutiny, no Presidential crime warranting an impeachment has emerged. 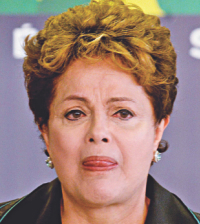 Nevertheless, the political right has thrown the kitchen sink at Dilma Rousseff. They rejected the outcome of the 2014 elections and appealed against her alleged campaign finance violations, which would remove from power both Dilma and the Vice-President – now, chief conspirator – Michel Temer (strangely enough, his case has been parked). The right simultaneously started impeachment procedures in Congress. The media has attacked the government viciously for years, the neoliberal economists plead for a new administration to ‘restore market confidence’, and the right will resort to street violence if it becomes necessary. Finally, the judicial charade against the PT has broken all the rules of legality, yet it is cheered on by the media, the right and even by Supreme Court Justices. Yet… the coup de grâce is taking a long time coming. In the olden days, the military would have already moved in. Today, the Brazilian military are defined more by their nationalism (a danger to the neoliberal onslaught) than by their right-wing faith and, anyway, the Soviet Union is no more. Under neoliberalism, coups d’état must follow legal niceties, as was shown in Honduras, in 2009, and in Paraguay, in 2012. Brazil is likely to join their company, but not just now: large sections of capital want to restore the hegemony of neoliberalism; those who once supported the PT’s national development strategy have fallen into line; the media is howling so loudly it has become impossible to think clearly, and most of the upper middle class has descended into a fascist hatred for the PT, the left, the poor, and the black. Their disorderly hatred has become so intense that even PSDB politicians are booed in anti-government demonstrations. And, despite the relentless attack, the left remains reasonably strong, as was demonstrated on 18th March. The right and the elite are powerful and ruthless – but they are also afraid of the consequences of their own daring. There is no simple resolution to the political, economic and social crises in Brazil. Dilma Rousseff has lost political support and the confidence of capital, and she is likely to be removed from office in the coming days. However, attempts to imprison Lula could have unpredictable implications and, even if Dilma and Lula are struck off the political map, a renewed neoliberal hegemony cannot automatically restore political stability or economic growth, or secure the social prominence that the upper middle class craves. Despite strong media support for the impending coup, the PT, other left parties and many radical social movements remain strong. Further escalation is inevitable. Watch this space. Alfredo Saad Filho is Professor of Political Economy at the SOAS Department of Development Studies, London University. His research interests include the political economy of neoliberalism, industrial policy, alternative macroeconomic policies, and the labour theory of value and its applications.